Enlarge Banana connector for loudspeaker cables. 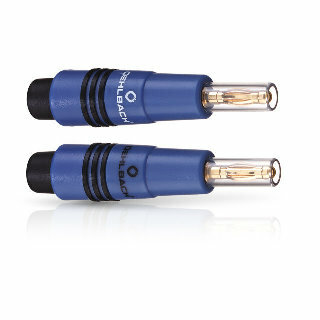 The fully insulated banana plugs are suitable for connecting loud speaker cables that are up to 6mm2 maximum. The plastic isolation cover retreats automatically into the casing once the banana is plugged in and reappears again once the plug is removed. This ensures optimal protection from short circuiting. The bananas are equipped with connections plated with 24 carat gold, which offers continuous protection from oxidation. Optimum assembling with wire end seeves.